There was a time when the humble stopwatch was the best and easiest way of measuring the end user experience of an application. 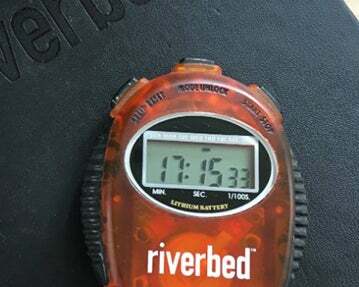 In fact, as the picture to the left proves, Riverbed used to provide a free stopwatch for every customer during a PoC, such was the confidence that the SteelHead appliances would improve user experience. It was a joy to watch users’ faces when they experienced an optimized connection to an Exchange server or fileserver, then diligently writing down the before and after timings. As a pre-sales engineer it was very rewarding providing the list of before then after timings to a network manager, confidently claiming that users would no longer have to wait five minutes or more just to save a file. Who doesn’t like to show value? However, the harder job came when trying to establish how the user experience of client server or virtual desktop apps had improved. This became more of an art than science. Key transactions had to be identified, workflows built and timing had to be averaged across a number of iterations to ensure a good typical measurement or user experience. Then there was the “does it feel faster” question to the end user…. Now Riverbed has a truly scientific way of proving end user experience, not only for proving the value of technologies like WAN optimisation, but also for proving the benefits or impact of ANY changes to I.T. 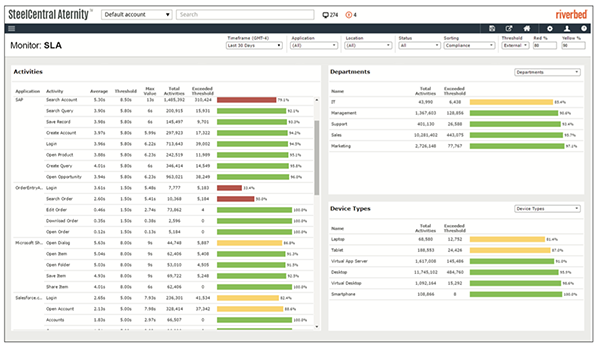 Riverbed SteelCentral Aternity monitors the end user experience of any application from the perspective of the end user’s device. It measures and records from mouse click to screen render, the behavior and performance of the defined application, client server or virtual desktop delivered, measuring the execution time of every transaction, using a virtual stopwatch, for every user, all the time. At the same time it monitors the end user computer environment. Memory, CPU, disk access are all logged and measured to give a clear view of how the end user is experiencing their IT performance. Using ‘big data’ type analytics it will then display extrapolated views of user community IT performance across your whole network, providing quick and easy to understand metrics showing how IT is providing services to the business. And because data is stored and comparisons built between data points, it’s very easy to establish the impact if or when changes to an IT environment are made. I’m glad Riverbed aren’t in the stopwatch business, they’re not needed anymore. Instead we’re proving the IT systems that have been invested in are adding value to the business we are serving, or helping us troubleshoot what has changed or where the problems are. If you would like a demo of the solution in action, take a look here for a free download and register. I still have that stopwatch….15? yrs old, big lithium battery visible from rear, never removed, still works (because I dont use it, plus the user interface on the watch is beyond me and I lost the manual 🙂 doug, Former sysop at Conexant/Mindspeed in MA 199x-200x. My remote-end appliance had minimal HW (1g ram?) but worked rather amazingly even for interactive/new xfers, it seemed. Somehow, TCP could be accelerated on the T1 WAN for a remote office of 50+ engineers.